AtlasIED ZCM-V2+T registers as a communication endpoint directly within InformaCast, and SA-Announce Advanced Notification applications, supporting audio broadcast to enhance physical security while improving day-to-day communications through advanced alerting, bell schedules, pre-recorded, & scheduled announcements, while leveraging the WAN/LAN Network Architecture. When used within a Cisco Environment, these same IP speakers from AtlasIED can join Cisco’s Unified Survivable Remote Site Telephony (SRST) as a supported device within SRST endpoint Architecture. Cisco’s SRST provides remote location call-processing redundancy when access to the centralized Cisco Unified Communications Manager is interrupted because of a WAN outage. The ability of LAN communication between any combination of phones and speakers is particularly critical during an emergency (which may be the actual cause of the WAN outage). Where 3rd party notification applications are not required, the ZCM-V2+T IP–to–Analog Gateways can register as SIP devices directly to a SIP server or VoIP Communications Manager for critical alerts /public address applications. 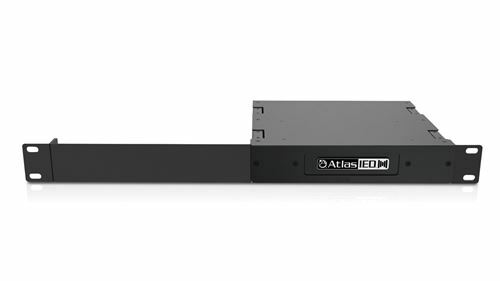 The ZC1PRO+ includes the PA702-RMK rack mount kit for use in full width equipment racks and optional transformer, model ZCMT, for use in applications requiring line out signal with additional volume level adjustment. The ZCM-V2+T from AtlasIED consist of a factory assembled PCB control board housed in a rugged and compact 1RU chassis. 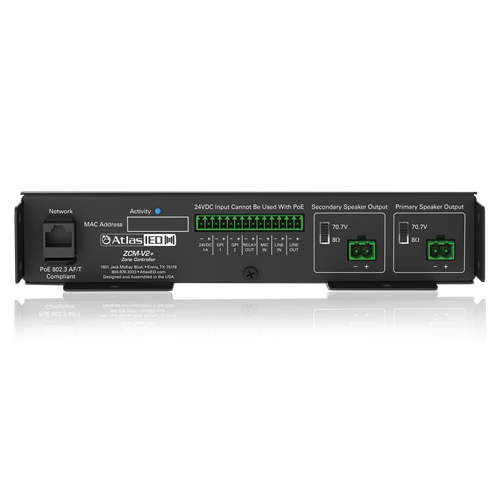 The unit provides the same addressable end point functionality as an IP speaker or IP phone with the convenience of line level and amplified audio output. 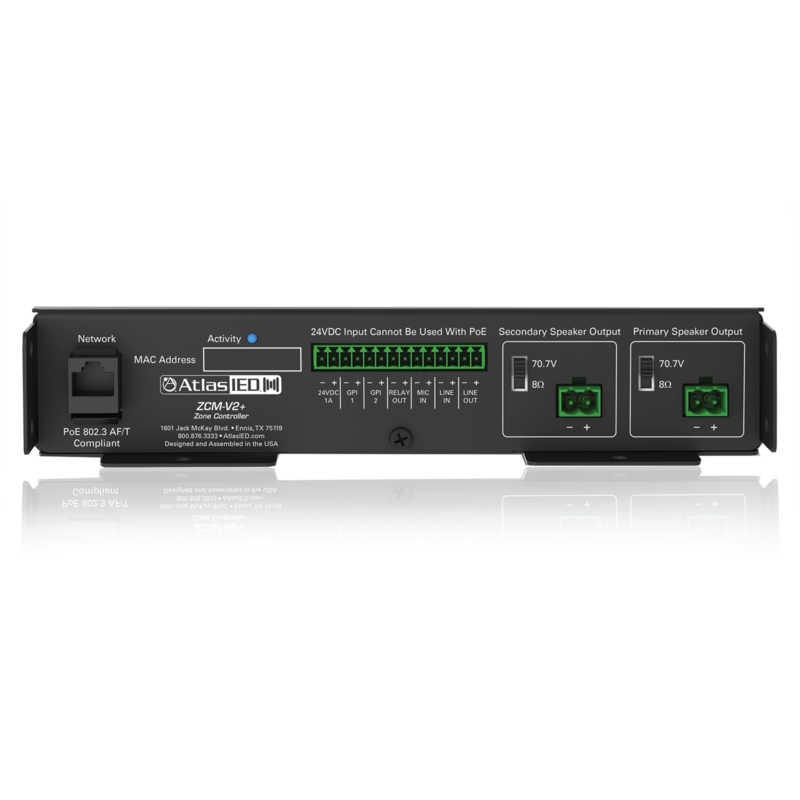 This line level output is ideal for use with AtlasIED AA, PA, or CP series amplifiers to power large zones of traditional 25V, 70.7V, or 100V AtlasIED speakers or paging horn speakers. In addition to the line level output, the ZCM-V2+ provides 2-channels of 15-Watt RMS at 8-ohm or, 70.7V amplified output to drive a small cluster of analog speakers. It also includes 2 GPI Inputs, 1 GPI Output and Microphone input for talk back or listen applications. The ZCM-V2+T features include Auto-provisioning and auto-registration. This is an easy and timesaving way to configure our IP speakers on your Voice VLAN, similar to a VoIP handset. By sitting on the same VLAN, both VoIP phones and IP speakers share the same Quality of Service (QoS) so communications are always secure and guaranteed.